We always feel close to the Lord when we are outdoors enjoying his amazing creation and worshipping Him. 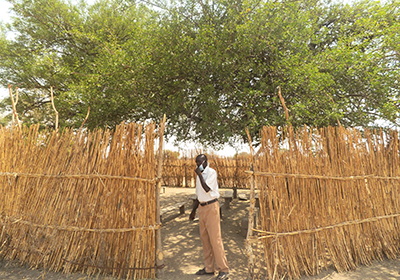 In South Sudan, it is very easy to be worshipping the Lord ‘in church’ but actually be outside! Many churches are a group of people in a village gathering and praying under a tree. Four of our five church plants are in small villages with just humble clearings and the shade of a tree to give relief from the relentless heat and protection from the scorching sun. It started with a burden for ‘Maloney’ where we have been conducting medical outreaches for the past three years. He recently moved to Maloney, which is not his home, and began sharing the gospel with the local community. As there was no church, he picked a tree and started praying and preaching on Sunday. Soon people started to gather to hear what he was saying and they stayed! As Santino taught the Word of God people listened and came back for more, week after week, totaling now over 70 people. What is so awesome is he used what he learned through our Community Health Evangelism to mobilize the church community to take ownership of their place of worship. Together they gathered sticks and made a fence around the tree and also benches to sit. Without the motivation of money or goods, this is not easy to accomplish. Santino prayed and used what he learned and today he is so proud of his church in Maloney. And we are so proud of him, his trust in Jesus as Savior and the Holy Spirit to be his guide. graduated pastors are all sending people from their villages. We are excited to host 30-40 people for this event. We also are hosting the fourth and final Training of Trainers (TOT) for Community Health Evangelism (CHE). Each trainer has a committee in their village that selects Community Health Evangelists and then oversees their service to the community. We are excited to see this program get into full swing in the villages. Pastor Santino and Peter Malok are TOT’s serving the community of Maloney. As CHE expands, we are looking for one year interns to help with the follow-up of the CHE’s and TOT’s in the villages and assist Pastor Kibe with the church plants. Pray for Agums’ visa, we still have no news from the embassy. Pray for the STS and CHE teams to be effective in communicating and teaching. Pray for Pastor Santino and his church to grow in knowledge and be a light in the community. Pray for Peter Malok (est. age 26) as he begins his final exams to complete high school. Pray for our team as we juggle the needs of our medical clinic with the medical needs in Maloney. Pray for medical cover for Dr. Tom for 2 months in the summer, so he can take his annual leave. We are blessed to be part of the Kingdom Work. Please prayerfully consider partnering with us financially to further the territory for Jesus Christ. I have caught up on the recent posts by Tom, Kibe, Sham, Whitney, Suzy, et al. Great writing and photos! Wonderful work of The Lord and so encouraging to hear and see the saints of God serving in unity and love. 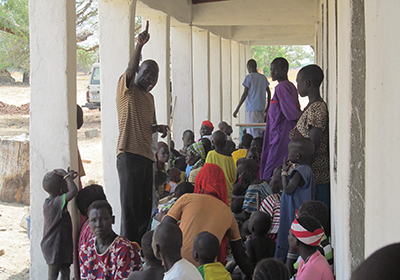 We will be praying for you all and the church in S Sudan. So honored to know of this ministry, and have a small hand in its support! What an amazing outreach you are developing in this area of the world. Praying especially for the visa issue to be cleared up w/ Agum…it’s TIME!!! Also, keep us up on the progress for your house!